The Lucid is a wooden minesweeper, that had been used as a house boat from the eighties till 2004. 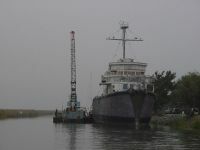 In 2005 she was donated to be converted in a minesweeper museum. Her house styled interior was removed and she is looking again like in her navy time. These photos are from 1985-1986. All photos are copyright by Dan Keller.